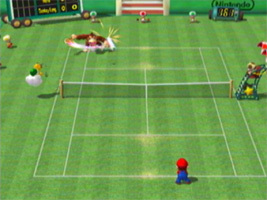 A tennis game on the GameCube starring Mario and friends. This time, each character has their own offensive and defensive Power Moves, allowing them win points more easily. Hit the ball over the net and past your opponent to win points, with the first player to score after 40 to win games. Win games, sets and matches to earn trophies. As well as standard tennis courts, you can also play on themed courts with their own obstacles and hazards. You can also take part in tennis minigames, four player matches and tournament modes. 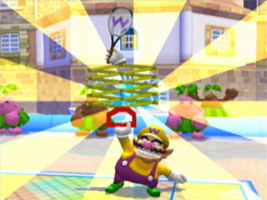 Wario's defensive Power Move is called the "Ultra Hand" - an extendable claw that hits the ball back wherever it may be. This move is named after Nintendo's first successful toy, an extendable claw used to grab coloured balls, also called the Ultra Hand, released way back in 1966. One of the Gimmick Courts is the Mario Classic Court, decorated with pixellated graphics from the original arcade Mario Bros.
Shellcreepers, Sidesteppers and Fighter Flies walk across the court, tripping your character. Hitting the POW Block above the net will knock the enemies over, allowing you to kick them off the court. Freezie appears and freezes sections of the court, reducing traction. 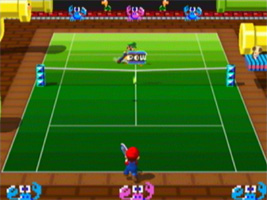 One of the minigames is set on the Mario Classic Court, and involves collecting Coins.